'VIVA PAPA' was shouted out by the 6,000 faithful gathered in the Plaza Obradoiro to greet the Pope as he arrived at the Cathedral of Santiago de Compostela. Pope Benedict got the full pilgrim experience at the Cathedral. He was given a pilgrim cape with the symbolic scallops adorning it. The scallop signifies the symbol of the Camino, the grooves represent the different routes of the pilgrimage, the base being the final point, the Cathedral. The scallop shell is also a metaphor for the pilgrim, the shells wash up along the shores of Galicia, just as the pilgrim arrives at the Cathedral of Santiago de Compostela. The Pope greeted religious and faithful inside the Cathedral before proceeding to pray at the tomb of St. James the Greater. Like a true pilgrim, he then embraced the statue of St. James. This is an act that is done to mark the end of the Camino de Santiago. The Archbishop of Santiago de Compostela, Msgr. Julian Barrio Barrio welcomed the Holy Father to the Cathedral and resting place of St. James. [In Galician:] I thank Archbishop Xulián Barrio Barrio of Santiago de Compostela for his kind words. I am happy to greet all of you with affection in the Lord and with gratitude for your presence in this highly significant place. In this Holy Year of Compostela, I too, as the Successor of Peter, wished to come in pilgrimage to the “House of Saint James”, as it prepares to celebrate the eight-hundredth anniversary of its consecration. I have come to confirm your faith, to stir up your hope and to entrust to the Apostle’s intercession your aspirations, struggles and labours in the service of the Gospel. As I embraced the venerable statue of the Saint, I also prayed for all the children of the Church, which has her origin in the mystery of the communion that is God. Through faith we are introduced to the mystery of love that is the Most Holy Trinity. We are in some sense embraced by God, transformed by his love. The Church is this embrace of God, in which men and women learn also to embrace their brothers and sisters and to discover in them the divine image and likeness which constitutes the deepest truth of their existence, and which is the origin of genuine freedom. Truth and freedom are closely and necessarily related. Honestly seeking and aspiring to truth is the condition of authentic freedom. One cannot live without the other. The Church, which desires to serve unreservedly the human person and his dignity, stands at the service of both truth and freedom. She cannot renounce either, because what is at stake is man himself, because she is moved by love for man, “the only creature on earth which God has wanted for its own sake” (Gaudium et Spes, 24), and because without this aspiration for truth, justice and freedom, man would lose his very self. From Compostela, the spiritual heart of Galicia and at the same time a school of unbounded universality, allow me to exhort all the faithful of this beloved Archdiocese, and those of the Church in Spain, to live their lives enlightened by the truth of Christ, confessing the faith with joy, consistency and simplicity, at home, at work and in their commitment as citizens. May the joy of knowing that you are God’s beloved children bring you to an ever deeper love for the Church and to cooperate with her in her work of leading all men and women to Christ. Pray to the Lord of the harvest that many young people will devote themselves to this mission in the priestly ministry and in the consecrated life: today, it is as worthwhile as ever to dedicate one’s whole life to the proclamation of the newness of the Gospel. I cannot conclude without first expressing my appreciation and gratitude to the Catholics of Spain for the generosity with which they support so many institutions of charity and of human development. Continue to maintain these works which benefit society as a whole, and whose effectiveness has been shown in a special way in the present economic crisis, as well as when grave natural disasters have affected certain countries. [In Galician:] With these sentiments, I ask Almighty God to grant all of you the boldness which Saint James showed in bearing witness to the Risen Christ. In this way, may you remain faithful in the ways of holiness and spend yourselves for the glory of God and the good of our brothers and sisters in greatest need. Thank you. After his address the Pope placed incense inside the legendary Botafumiero (smoke thrower) thurible which was then ceremoniously swung through the Cathedral. The Hymn of St. James was sung while this happened. 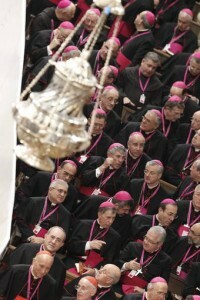 The thurible continued to swing overhead as the Pope imparted his apostolic blessing on all present. He then exited to great applause into the Plaza Obradoiro where he will celebrate Mass later. 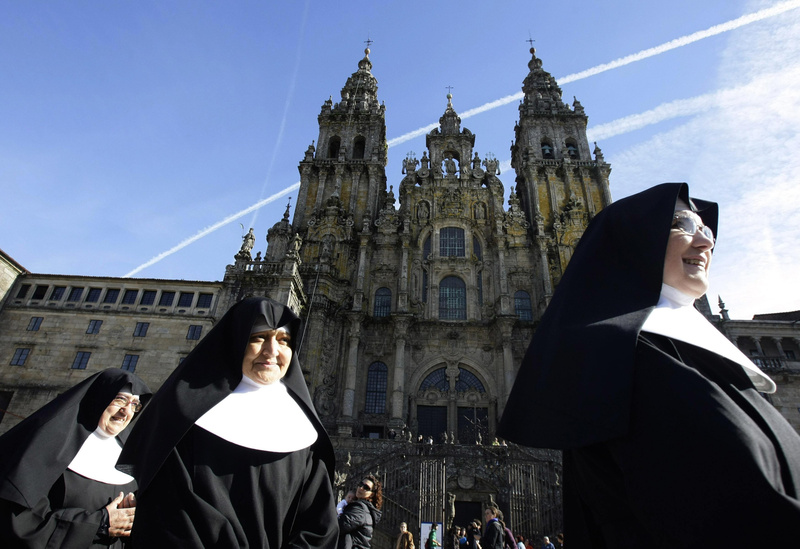 The open air Mass in the Plaza del Obradoiro happens at 11:00 am ET. [Correction: 11:30 am ET] Tune in then for our continued live coverage.